We sometimes fall in love with certain antennas. The song fits the ad. At least 10,000 Maniacs loved their Gotham antennas. For those who love magical antennas, Gotham style antennas are still available today under various models and names. How good does a Gotham antenna work? So good that even a Gotham vertical cannot beat a Gotham vertical. 1.) Only very specific feed line coupling systems can be used. Other commonly used or reasonably common methods fail, without logical technical explanation of why other common methods won't work. 2.) Claims are made models will not work, while reliable or meaningful A-B comparisons refuting model accuracy are missing. The common claim is "models will not work with this antenna". 3.) Performance verifications are either comparisons of grossly dissimilar systems (such as different polarization or antenna types), or Gotham standard reports. How much DX we worked, or far we worked, is not a verification of performance. I have worked Europe, Australia, and Asia on 160 meters from my mobile, and my 160 mobile antenna is less than 1% efficient. 4.) Comparisons are made only to less-than-ideal, or highly variable, systems. For example, a known mediocre performance system might be used to verify another antenna. A reference antenna must be a known, consistent, reliable, performer. My 160 meter mobile antenna, even though less than 1% efficient, ties or beats some large home-station antennas. Gotham used advertisements that appealed entirely to emotion. Their ads actually had no performance information at all, just how some person in some unknown location worked a long list of DX. Gotham ads stood out from all other advertisements in the 50's and 60's, and generated quite a few sales to new amateurs. According to Gotham advertisements, Gotham antennas were the world's best! 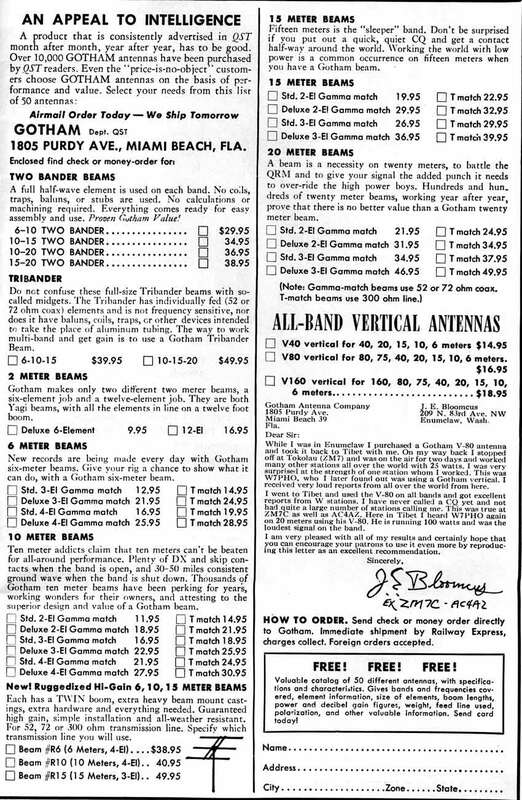 The famous Gotham V-80 vertical advertisement from the 50's and 60',s and Gotham Antenna catalog and antenna list, appears below. The V-80 was a simple 23-foot tall piece of aluminum tubing, loaded with a common modest-size B&W air inductor. The package included a cheap mount and a few alligator clips. To change bands, you had to run outside and move the alligator clips around until you found a low SWR, or until your rig would load up into whatever SWR the antenna had. 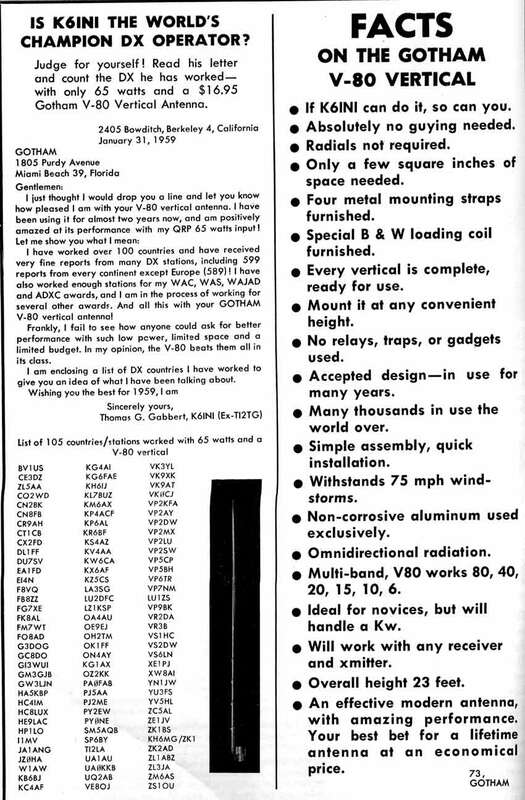 Read the advertisement below and note how Gotham's claims are almost identical to claims made for new theories, and how similar claims are to claims for many antennas being sold today!